Urns have long been traditional planters of exemplary beauty and planning, but this modern version will steal the show. At 48 inches tall, it sports a generous 26 inch top diameter to allow for a full display combining flowers and greenery. 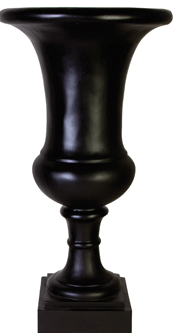 In a break with tradition, this beautiful urn is an attention getter with its black color to contrast and highlight its contents. Proud gardeners and homeowners will find joy in this piece for years to come.